New Year’s Eve in Amsterdam is celebrated in the street. At 12 o’clock, People gather outside with champagne and ‘oliebollen‘ and wish everyone a Happy New Year (don’t forget: three kisses!). Everyone sets off their own fireworks. 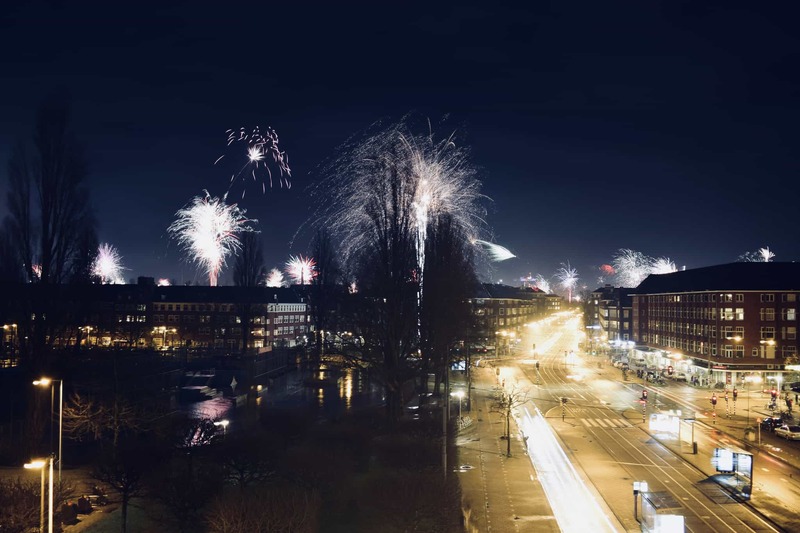 The Amsterdam City Council offers a big fireworks spectacle in the northeast side of Amsterdam (Kop van Java Island). The New Year’s Eve party in Amsterdam continues in living rooms all over the city and in the clubs. Choosing your New Year Eve Amsterdam in a club is best done with some anticipation because tickets for the best Amsterdam New Years Eve Parties sell out fast. New Year’s Eve in Amsterdam is celebrated outdoors. In Amsterdam, crowds gather at the main squares in the centre: Leidseplein, Dam Square, Rembrandtplein and Nieuwmarkt from around 21.30. There are bars outside and music. Just before the clock hits 00.00 hours, people take their bottle of champagne outside in the street where they live and wait for the New Year. They pour their glass, set off their own fireworks in the street and enjoy wishing everybody a Happy New Year. Street parties will last well into the night. Many clubs, bars and private parties continue partying until the early morning. Enjoy the Amsterdam Light Festival in a 75-minute evening canal cruise. A comfortable boat: heated, equipped with pillows, blankets, a bathroom and other luxuries. Mulled wine and hot chocolate on board! Let yourself be enchanted by the illuminated canal houses, bridges and light works of art and experience the unique atmosphere from the water with this Water Colours Cruise. With audioguide. Prior to the cruise, you can enjoy a winter apple punch, mulled wine or hot chocolate. Are you with a group? You can rent a luxurious and comfortable private boat for 8, 10 or 12 people with captain. The captain will guide you through all the light artworks in a 75-minutes canal cruise. On board you can enjoy unlimited hot and cold drinks (also beer, glüwein) and there are typical Dutch deep fried snacks and warm blankets. Where can I watch the best fireworks in Amsterdam? In 2018-2019, the city of Amsterdam organises its own official fireworks at Java Island. It’s a bit of a chilly walk to get there, as it is along the IJ waters, just East of Central Station. You have a great view on the city’s fireworks from the roof of the Nemo Sciene Museum (freely to enter). Nieuwmarkt is the hot spot for fireworks madmen. With Amsterdam Chinatown just around the corner, this is where you find the most spectacular fireworks shows (often with illegal fireworks). If you are afraid, avoid this area! Fireworks are popular on New Year’s eve in Amsterdam. Photo by: Eelco Cramer, Flickr. All clubs in Amsterdam organise their own New Years Eve party but be ware that clubbing on New Years Eve in Amsterdam is much more expensive than other nights. Entrances can be around 30 euros. Buy your tickets in advance to enjoy the ‘early bird’ discount and to be assured of a ticket. If you want to enter a party later during the night which is not sold out, you can try bargaining the price at the door. Taxis in Amsterdam are extremely hard to get on New Years Eve. Book a taxi in advance or make your way to the party before every one else does. Or rent a bike, at your own risk! Rough & Chique are ringing in the New Year in true Dutch style, taking over the warehouse-style The BOX. Putting together a lineup of urban and house artists, the party blends live and DJ sets for a night to remember. Local party heroes Girls Love DJs are hosting a New Years Eve party in Amsterdam in style. Taking place at AIR Amsterdam, a spacious but still cosy club near Rembrandtplein. On New Year’s Day, Amsterdam slowly awakes from the festivities. It will be a mess, with all the fireworks and champagne bottles covering the streets, but the heroes of the city (the cleaners!) will do their best to get everything nice and clean again. Apart from some souvenir shops, all shops in Amsterdam will be closed on January 1, 2019. Many museums will also be closed. Rijksmuseum, Van Gogh Museum and Rembrandt House Museum are open on New Year’s Day. New Years Day might be a good day to take a Amsterdam Light Festival Cruise on the Amsterdam canals. New Year Eve in Amsterdam is one of the most festive nights of the year in The Netherlands, celebrated heavily in large cities as well as small villages. Traditionally, people stay indoors until the hours strikes 12, inviting friends and family for cosy gathering with lots of food and drinks. People play board games or watch the traditional Oudjaarconference on television, a comedy/cabaret show aired on television about the events in Dutch society and politics. At 12 the party moves outside to light fireworks. Circling around the block, whole families drop by their neighbours, while cheerfully wishing everyone happy New Year (“Gelukkig Nieuwjaar“). Most remarkable is the amount of fireworks people buy and set alight. The tradition is rooted firmly in Dutch society, when even in the smallest of villages, fathers set off colourful fireworks for their children. If you want to know what it feels like to live in a war zone, cycle around Amsterdam just after midnight and you’ll get a pretty good idea. The streets of Amsterdam are filled with a thick mist of smoke while large explosions (much of the larger bangs come from illegal fireworks imported from China) are heard throughout the night. The Dutch tradition of fireworks does not come without risks. Every year, hundreds of people get injured, losing fingers and eyesight. Most dangerous are the fire crackers failed on the night it self and are gathered by children the next day. Because of the humidity, these left over crackers seem to be dead, but often enough, they just take much longer to explode, surprising the kids and with often seriously damaging effect. In some towns and neighbourhoods (like Amsterdam Noord), the crowd prepares a large fire by gathering christmas trees and setting them ablaze. Fires could last well into the morning hours, as well as the parties. Dutch oliebollenkraam at Kinkerstraat, Amsterdam. New Years Day is filled with more traditional get-togethers. Families and local communities or organisations invite a number of people for the ‘nieuwjaarsreceptie‘, a new years reception, where everybody wishes each other a Happy New Year. Some bars and coffee shops might close on New Years Day. All other days everything is open as usual. we were delayed in our plans & have managed to get a reasonable place in Bussum which is 30 mins outside Amsterdam. Would anybody have an idea if the trains from Amsterdam central run to Bussum on New Years eve & New years day. My plans as a local, an all-inclusive party all night at this new jazzclub with my dearest friends, watch fireworks in the Jan Eef and eat a lot of oliebollen 🙂 happy to show some tourists around that evening! On NEMO’s website, it says there is no access to the roof in bad weather, during special events, ((at New Year)) and on King’s Day.